mwe3: 2016 is a prolific kind of year for you and your label. How does your new CD, Skyfields compare with your 2015 CD Otherworld in sound and scope? Did you set out to create something altogether different between the two albums? Kevin Kastning: Yes, thankfully it's turning into another busy year for me. I think Skyfields is indeed different from Otherworld in both sound and scope as you noted. I did intend for them to be different; I didn't want to release an album that was essentially "Otherworld 2." Otherworld consists of 16 tracks which are not directly related compositionally or thematically, but rather connected by mood and atmosphere. Skyfields is a single 63-minute composition in five movements. Even the instrumentation was a bit different: on Otherworld, I utilized five instruments; on Skyfields only two. mwe3: What inspired the Skyfields concept and why did you divide the album into five distinct parts, basically Skyfields parts 1  5? Are these like movements in a guitar symphony so to speak? Kevin Kastning: I had been thinking about longer solo pieces divided into movements, like a symphony. The original plan was for four movements totaling around 40 - 45 minutes. But compositions and improvisations can take on a life of their own between conception and completion. By the time it was complete, it was five movements and 63 minutes. I live and breathe classical music, so I think I naturally tend to conceive of longer compositions. The compositions I hear internally are becoming longer and longer pieces. This one was so long that it had to be constructed in movements. So your analogy of a guitar symphony is astute and pretty accurate. mwe3: Is Skyfields the first solo album of yours to feature the 36 string Double Contra guitar exclusively? Why did you choose to feature the 36 string as the exclusive guitar on all but 1 track, Skyfields III on which you play the 15 string? Kevin Kastning: Good question. 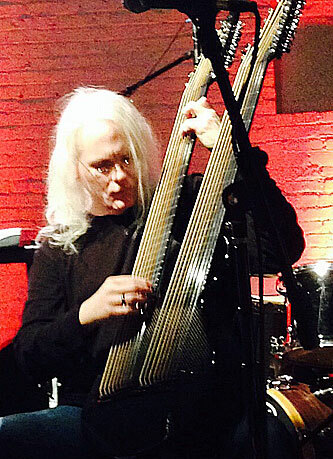 I used the 36-string Double Contraguitar on several tracks on Otherworld. At this point, I can't imagine doing an album project with only one instrument, but if I was forced to do so, the 36 would be the logical and obvious choice; at least, right now. 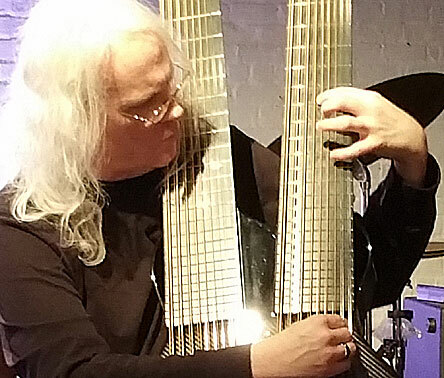 The 36-string Double Contraguitar is almost symphonic in scope. It was perfect for this.... I hesitate to say "album," but for this composition (Skyfields). I couldn't have realized this composition without the 36-string Double Contraguitar. I used the 15-string Extended Classical on the third movement, as it is the centerpiece of the composition, and I wanted something almost akin to a denouement, but only as a kind of turning point or secondary compositional catalyst for the composition in its entirety. The 15-string Extended Classical brings an entirely different voice than the 36, as well as a different register. Atmospherically, it's almost diametrically opposed to the 36. It was the ideal color and voice for the third movement, and provides a critical pivot in the composition. mwe3: Describe working on Skyfields with producer Sandor Szabo who lives in Hungary. Is it challenging to work with a producer who is five thousand miles away? Did you have any different approach to the sound of Skyfields compared with Otherworld  from the composing to recording and also the mastering effect. Kevin Kastning: I've worked with Sandor as my producer for a few years now; I think this is the third or fourth record of mine he's produced. The distance really isn't a problem in our case. We share the same recording values and aesthetics, so that alone is a great help. We're both in agreement about how we want the record to sound in terms of tracking, mixing, and mastering before I ever begin recording. We stay connected through email and Skype, so we can discuss the album in great detail when need be. He's a great help to me on the solo projects; it's safe to say that the first one would have never happened without him. As far as the recording process, the mix, and the mastering process, it was the same as we used for Otherworld. The composing process was different. Skyfields was entirely improvised in the studio, but was all based on compositional sketches. The recording schedule was pretty different when compared to Otherworld. Otherworld was recorded over a six-month period; Skyfields was entirely recorded in three nights. Sandor began by commenting on the length of the pieces. I didn't record the album in sequence, so I was shipping multitrack masters to him which were out of compositional sequence. And without explaining the overall compositional concept to him! After I'd completed the tracking sessions, we Skyped and I explained the concept, that it is one single extended composition in five movements. As soon as I did that, it all clicked for him; he started hearing the movements entirely differently and at that point he was pretty excited about it. As far as the sound and recording setting of the album, it was recorded in the same studio using the same microphone setup as Otherworld. The recording approach was pretty different; Otherworld was slowly recorded over several months; Skyfields was captured over three consecutive nights. It almost felt like a frenzy; like it had to be completed right then. mwe3: You said Sandor is coming back to the US and youre doing new recording and some live concerts with him. Is that still happening or has it already happened? What kind of albums are you planning to record with Sandor next and when was the last time you were in Hungary? Kevin Kastning: Sandor was here for several days in October 2015. We were mostly in the recording studio while he was here, but we did one concert performance in Massachusetts and a live radio performance in New York City. The first album from those recording sessions will be released later in 2016. I'm not sure what our next recording project will be; we've discussed a few things, but we recorded two full albums when he was here, so it's not likely we'll be back in the studio together this year. He's asked if I'd come to Hungary later this year for a few concerts and more recording sessions and I will do that. Last time I was in Hungary was for the 2012 European tour. mwe3: Do you consider the 15 string guitar to be more a 12 string sound with the added 3 bass strings under the double course 12? As you rightly said, theres no going back to the six string now! How many 15 string guitars are there in the world? Do you hold the copyrights for both the 15 string and the 36 string double contra guitars? Kevin Kastning: No, I don't hold any instrument design copyrights. As far as I know, this is the only 15-string! I don't consider it to be in the 12-string family at all. 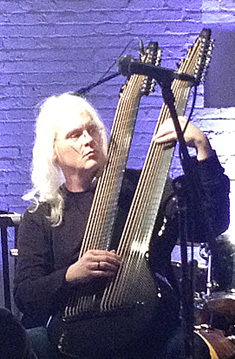 12-strings have four courses in octaves with two unison courses. The 15-string classical is, for me, closer to a lute in voice and execution. All the double courses (and there are mixed single and double courses) on the 15 are unison, no octaves. At least they are for now; no doubt I'll be trying some experimental tunings on it at some point. The additional courses are two on the bass side (B, F#) and one on the treble side, so the tuning range of the courses is from F# on the bass side up to A on the treble side. Like a classical guitar, it is all nylon strings; unlike the 36, which is all steel strings; mixed bass and guitar strings in fact. It is really an entirely "other" voice for me. It's difficult to categorize it, even for me. I've had it for just over a year now, and the first three or four months I had it, I just could not wrap my head around its voice. It's a truly unique and wondrous voice, but it was so unlike anything else that it took me a long time to really learn the voice. I don't mean learn the physical playing technique, which is still true of any of my instruments; I always have to shed them for a few months before using them in a recording or performance. But with the 15, it seemed the new physical technique didn't take long at all; it felt totally natural almost from the first day. However, its very highly unusual voice was a learning process for me. Instead of being a new color, it's more like an entirely new palette. It had a much deeper impact on my thinking than I ever imagined. Like the 36, it was built by luthier Alistair Hay at Emerald Guitars Ireland. mwe3: You recorded Skyfields right at the height of winter at the end of 2015. Is there a darker or more hermetic quality to Skyfields because of the winter effect on your approach? Dark vs. light, hot vs. cold? Do these spirit effects have an impact on the albums sound? Also how did you decide on the CD cover art for Skyfields, which was done by an artist in France? 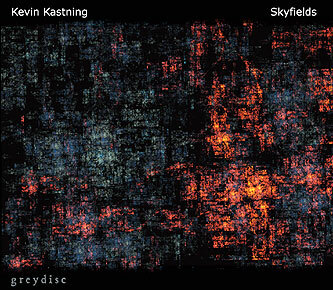 Kevin Kastning: The cover art for Skyfields was done by Tim Paulvé in France. Tim is a fantastic and original artist. I selected it because I felt it captured a key element of the Skyfields composition. I am hesitant to say anything else about that, as I don't want to explain too much about the background of the composition, what it's about, or what it means. I never want to precondition listeners. I want listeners to approach it from a pure and clean standpoint, and to find their own unique and individual meanings in the music. Yes, I think there is certainly a darker and deeper overall aspect to Skyfields than some of my other work. "Spirit effects" is a good way to put it. I suspect recording it during winter certainly had an impact on it. I feel a deep affinity for winter, and feel the most like myself during those months. For me, winter and snow are just magical. I'd posit that recording in winter has as much of an impact on my music as other artistic influences, such as other composers, for example. mwe3: How about plans for other, new guitars that you are working on or are in the design stages for? Do you often think about creating new guitars to fit your expanding guitar concepts? What are some of the ideas that youre considering now for future use? Is there a way to bring these expanded guitars more into the mainstream or are they too experimental and have you discussed these extended range guitars with other guitarists, such as Steve Hackett, for example who has said some nice things about your music? 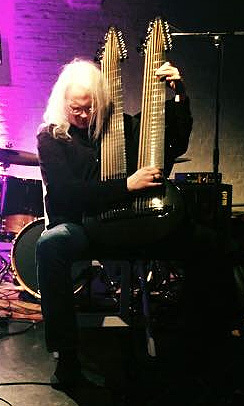 Kevin Kastning: It's not so much the expanding guitar concepts that give birth to these instruments; it is the expanding compositional concepts. Yes, there are two new ones coming up. The first is a 50-string, which should be completed by the end of the year, again from my partner and friend Alistair Hay at Emerald Guitars in Ireland. The specifications and design mockups are complete; we've been working on this one for much longer than any of the others. It is far more complex, as you might imagine. It will likely become my main instrument as soon as I have it. The 50-string will have a much broader range and registers than the 36-string Double Contraguitar. I already have some compositions awaiting its arrival. The second won't be until 2017; it is to be something like a 27-string instrument. I did receive another very nice email from Steve Hackett just a couple of weeks ago, congratulating me on Skyfields and on the 36-string. mwe3: So here we are only 3 months into the new year and youve already released several albums over the past few months. Tell us about other plans you have for 2016 and how far ahead are you planning other albums and musical ideas for this year into 2017? Kevin Kastning: Well, the next record release will be the new duo album with Sandor Szabo; it's completely recorded and mixed. This one will be our best record yet; I think this is our 6th duo album. It will be out this summer. The next record with British electric guitarist Mark Wingfield is also in the can; it was recorded in December 2015, and will be released in late 2016. Recording sessions with Carl Clements begin in May for our next album, which will be released in 2017. I've already begun work on my next solo project; that will also be released in 2016. Mike Metheny (fluegelhorn) and I are actively at work on a new duo album. I'm not sure of the release date for that, but I'm very excited about this project; I think it will be a very rare recording for us both. I've admired Mike's work for many, many years. If the 50-string is completed on-schedule, then there will be a new solo album based around it which will be released in early 2017. Guitarist Markus Reuter (Stick Men, King Crimson) recently asked me to do some US concert dates with him, and we've discussed doing an album together as well. I have tremendous respect for Markus' work, so I am certainly looking forward to that. Mark Wingfield and I have some UK concert dates later in 2016/2017. There is the European tour with Sandor late this year or next year. There is also a possible trio recording project with Sandor about which I can't say much right now as it's all still in the works, but that will be a very cool project. Guitarist Terje Rypdal and I have discussed recording a duo record, but I have no idea of a schedule for that as yet. I have a few live on-air radio performances coming up this year for various NPR stations, and I always enjoy those. And a few dates in New York City coming up as well. Michael Manring and I are planning our second album together; we've been speaking about recording dates and schedules. I am really looking forward to working with Michael again.